The Aryans left no genetic, archaeological, or cultural trace of their existence before their acculturation in Europe. The Europeans should be aware that the only legacy that they received from the Aryans is their Indo-European language and the gene that controls testosterone overproduction – linked to libido and aggressiveness. Apart from that, the Europeans are still genetically, ethnically, and culturally Old Europeans, today more than ever. The Europeans (and the West) are today leading the world toward a sustainable development; the Europeans are the Paladins of Democracy and Egalitarianism; The Europeans are the defenders of human rights and of women dignity; the Europeans are the promoters of the abolition of slavery, death penalty, and wars. All these values are in the cultural DNA of the Europeans, a legacy, which we have inherited from pre-Indo-European populations that respectfully lived in harmony with nature, that were democratic, egalitarian, matriarchal, and peace loving far before the Indo-Europeans showed up. If you too believe in these values… you may be an Indo-European speaker, but you are culturally Old European! Istvan Kiszely has recently published (Magyar Demokrata) another good work: he has found out that 1 (one) design – the one of the Székely kapu – is found in several places on the way from China to Hungary. Good job, Istvan! In the meanwhile, I have found out that some 150 designs of some thousands of dated archaeological artefacts, cultural markers, and sacred symbols migrated from Bronze Age Europe to Arsia and back to Hungary. Furthermore these designs also reached China, Korea and Japan. Finding out where the Magyars came from was as simple as comparing the archaeological finds of the Honfoglalás time in Hungary with the finds of the areas where other cultural markers of the Magyars (see “Honfoglalás…”) had been found. The presence of similar designs and symbols in a large area of Eurasia in the time frame from the Neolithic (Gold Idol Civilization) to the middle of the last Millennium B.C. (Agglutinia, Pannonia and Magna Pannonia) is the evidence of the existence of the largest and most long living civilization ever on earth. The civilization of Agglutinia (from Hungary to Oxiana, 3rd millennium B.C) started fading with the arrival of the Semites in Mesopotamia, and of the Indo-Europeans in India and Europe. Wherever these populations arrived, the same pattern of events was experienced, starting with the disappearance of the ancient sacred symbols. Those sacred symbols survived only in Pannonia, and later on in Magna Pannonia until the middle of the last millennium B.C.. Only at this time, the Celto-Pannonici and other “Indo-Europeans” differentiated and separated from the Pannonici. In fact, most of the artefacts found in Europe before 500 B.C. (and labelled “Celtic”, “Greek, Geometric”, “Etruscan, Orientalising”) are congruent with the previous millennia of Pannonico Art and shall reappear in Europe later on with the Magyars. (No artefact, symbol, or design can be labelled “Celtic” or “Greek” if it existed in Europe along the previous millennia!). The civilization of Magna Pannonia extended, from the middle of the second to the middle of the last millennium B.C., from Pribaltika to Pannoniberia and from England to the Aegean Sea. 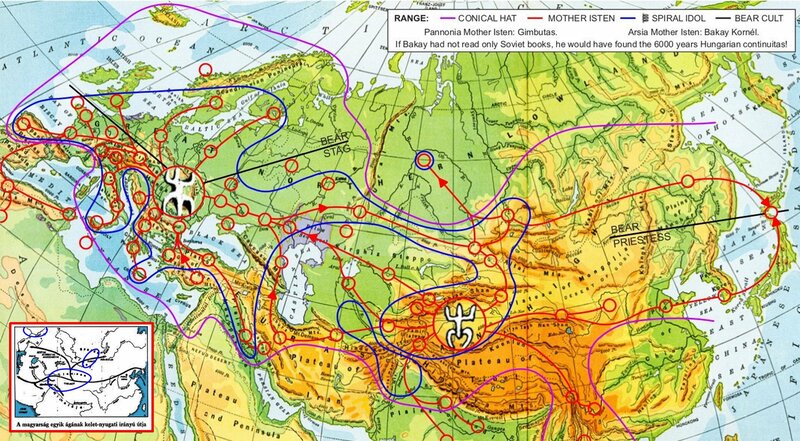 The comparison of archaeological finds allows to define with great accuracy the borders of the territories in which the Magyars had lived from the beginning of the 1stmillennium B.C. to the time in which they started their travel back to Hungary. The Avars had left the Tarim Basin earlier than the Magyars and had spent more time on the way: their Art (Transitional Art) had already lost part of the traditional symbolism that the Magyars will later bring to Europe. The book contains several comparison tables and explains these tables and the table in the abstract, which is a selected collection of pictures taken from the book. 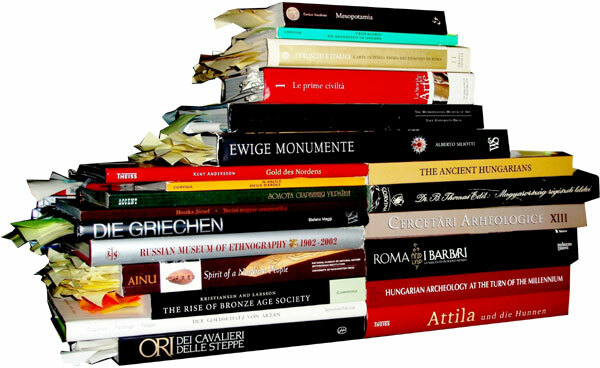 On the book, every single artefact is associated to the place where it was found, to the museum where it is kept, and to the dating that scholars have attributed to the artefact. Several lines of the table in the abstract are easily intelligible; some of them are puzzles that shall only be understood with the explanations on the book. For an easier and better understanding, you should have read the book “Honfoglalás…”, or at least its Abstract on this website. (Alternatively, if you are a fan of Diffusionism, you shall admit that the Pannonici were the masters of a civilization that was able to spread from Eire to Japan, from 5000 B.C to 1000 A.D.. However, in this case, you should be able to prove that the blue-eyed Ainu were aborigines in Japan, and were not Flavii having come from Europe. Be sure in any case that the artefacts the Magyars brought to Europe had not been acquired by trade: similar artefacts had disappeared from the market more than one millennium earlier and survived only in places no longer within reach for the Magyars!). About 50% of the images are taken from books, 40% from websites of Museums, 10% are pictures taken in museums by the author. I want to credit the Metropolitan Museum of Art, New York, USA, the British Museum, London, UK, and the Hermitage, Sankt Petersburg, RU for the best and most significant images of this book.